Three years ago I acquired a used spinning wheel. I took a lesson soon afterward, but I don’t think I was really ready to let spinning become a part of my life, as I let my new-found skills languish. Then, all of a sudden, a few weeks ago I got my wheel out, cleaned her up, dusted the cobwebs from my brain, and started spinning. And I love it! I’m still squarely in the fledgling stages, but I’m having a ton of fun with it. I consider the wool in the picture to be my first true spinning project. It’s ~2oz. of Mountain Colors Targhee in Lupine. 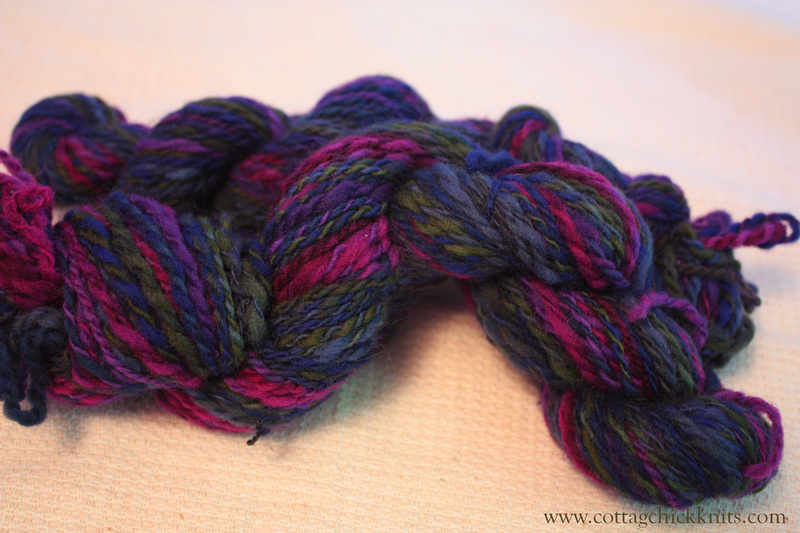 I still have to spin the other half of the batch, and I’m so looking forward to it! It is an amazing color scheme!